Weapons are of paramount importance in Red Dead Redemption 2, and this guide will show you how to keep them in excellent condition. 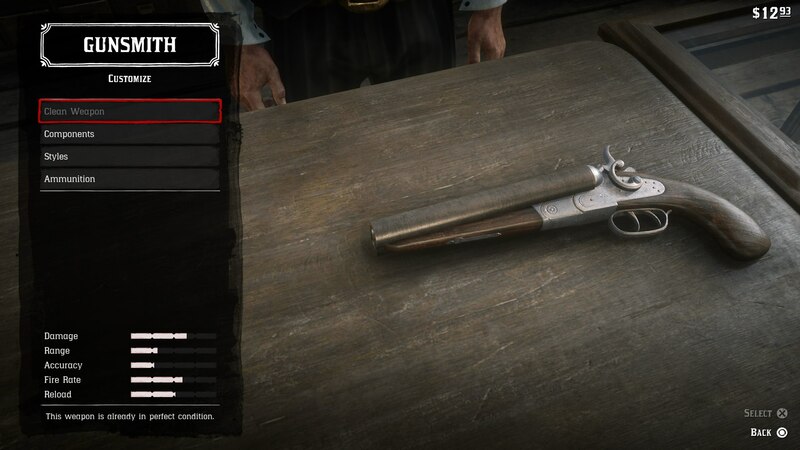 The more powerful your weapons are in Red Dead Redemption 2, the more chance you stand of surviving in the brutal wild west. In this Red Dead Redemption 2 weapons guide, we'll be walking you through how to upgrade your weapons in Red Dead Redemption 2 by visiting the nearest Gunsmith to you. But if you instead need anything else to do with Rockstar’s latest adventure, you’ll want to head over to our Red Dead Redemption 2 guides hub. It’s on this main page that you can find a complete beginner’s guide to the opening few hours of the game, as well as a full index list of all our additional guides on the game. 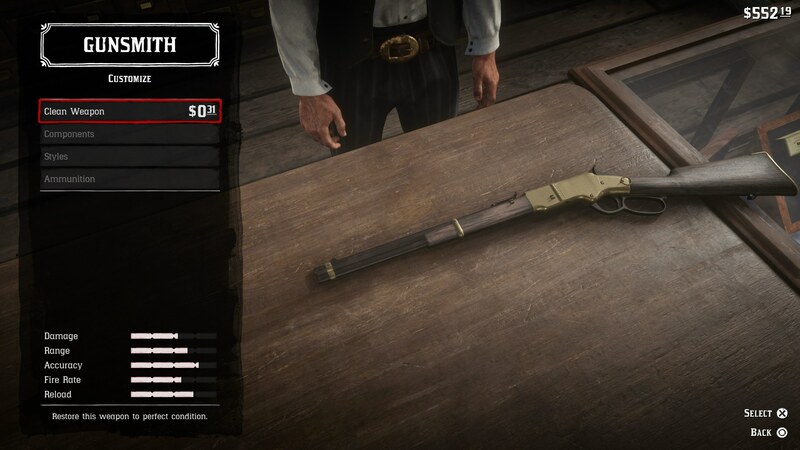 In order to customize your weapons in Red Dead Redemption 2, you’re firstly going to need to save some cash, since putting a new scope or stock on your rifle won’t come cheap. For some tips and tricks on how to earn some dollars in the wild west quickly, head over to our Red Dead Redemption 2 Money guide. 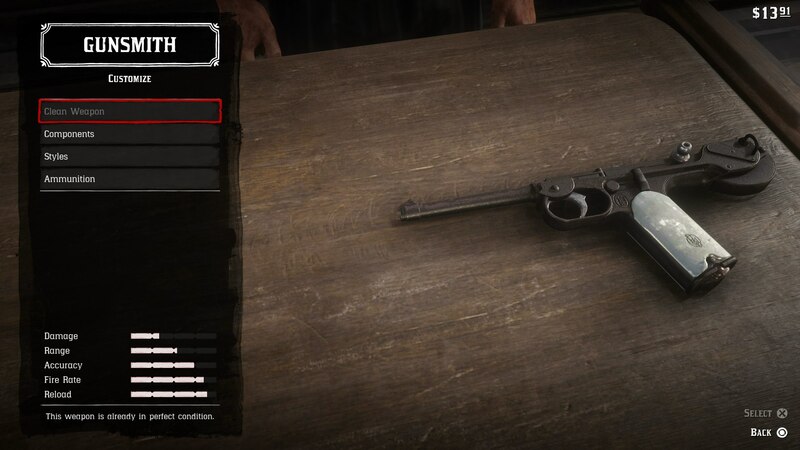 Once you have got some cash, you’re going to want to head to the nearest Gunsmith, marked by a pistol on your map. 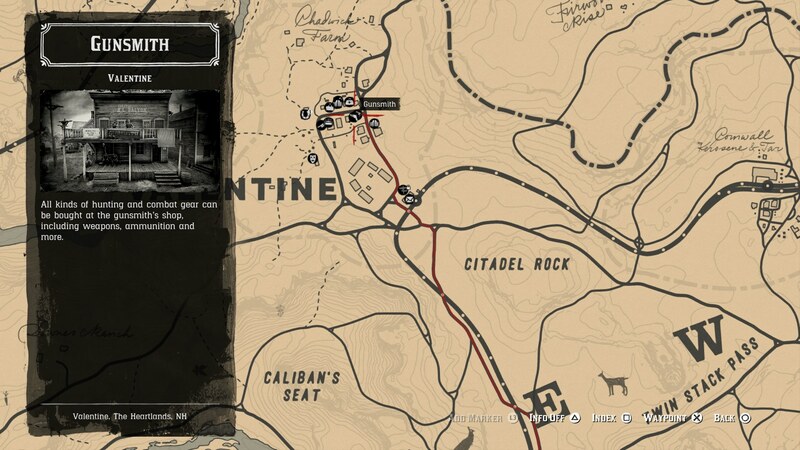 The closest Gunsmith you’ll have in the opening hours of Rockstar’s game can be found right in the middle of Valentine, the town located roughly in the middle of the entire map. 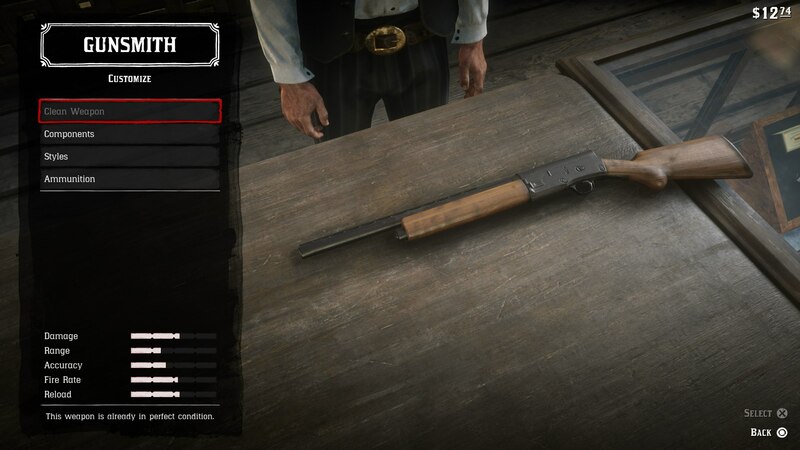 Select the ‘Customize’ option when you’re at the Gunsmith, and you can upgrade any weapon that Arthur is carrying, or has left on his horse. 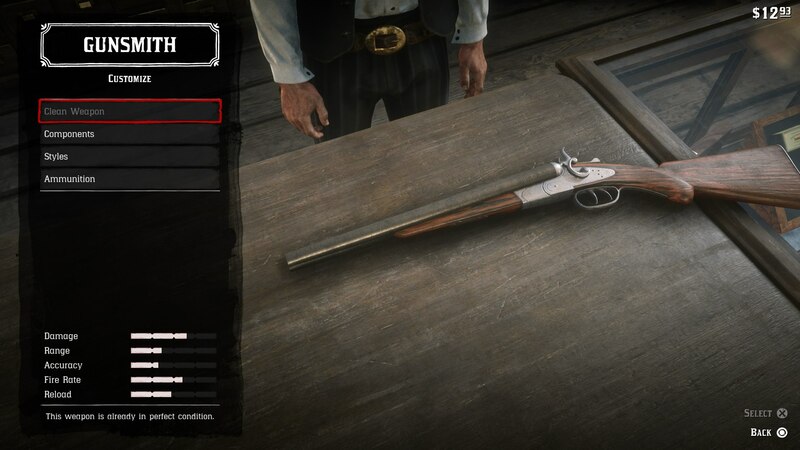 Firstly, a weapon needs to be clean and in perfect condition for a Gunsmith to be able to customize it, so select ‘Clean Weapon’, and pay roughly around a dollar to have your weapon polished up. Now select ‘Components’ for the weapon, and you can customize basically everything about it, including scopes, barrels, stocks, and more. 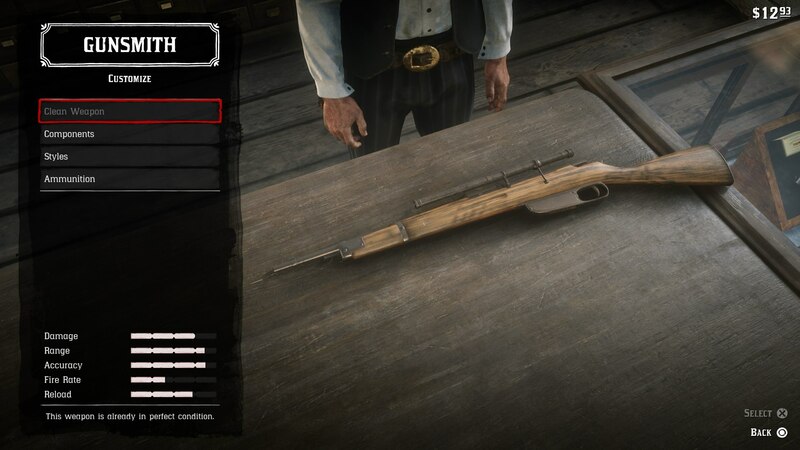 Note that only upgrading the weapon’s barrel, iron sights, and scope will actually provide any statistical bonuses for it, and the stock and wrap options are cosmetic only. 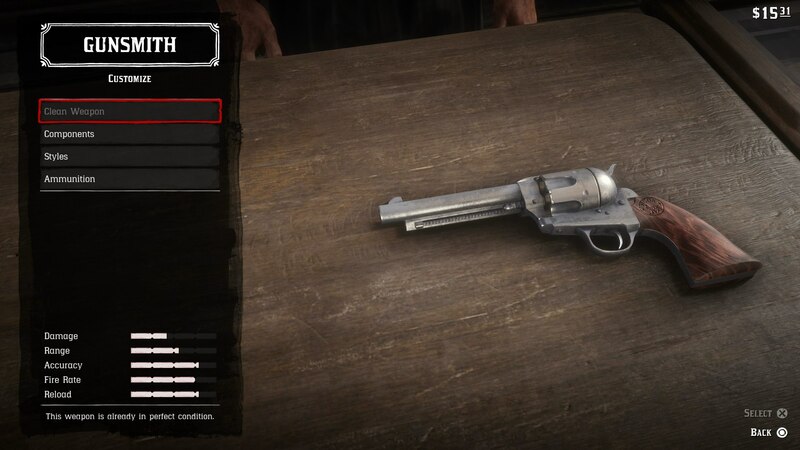 The best gun upgrades that you can possibly obtain in Red Dead Redemption 2 always come in the form of bonuses to your accuracy. This means you're going to want to upgrade the scope or sights on your weapon as soon as you've got the cash to spare it. 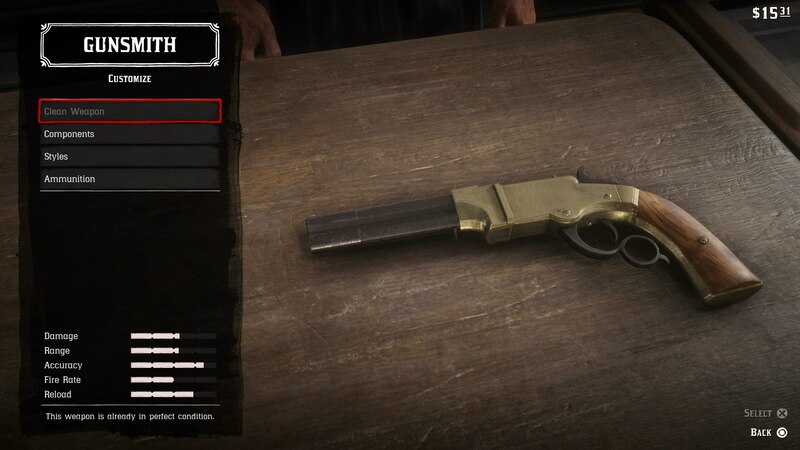 Whenever you're caught in a running shootout, or a gunfight from horseback, you're always going to want to prioritize a weapon with accuracy, over firepower. 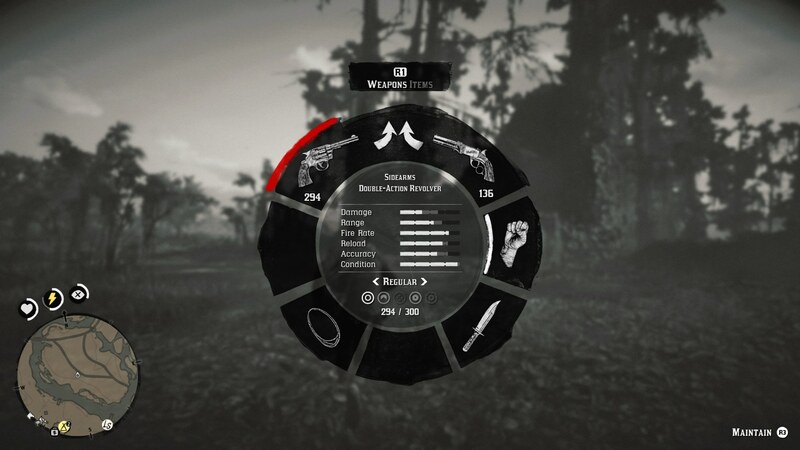 If you ever want to check on the condition of a weapon in Red Dead Redemption 2, simply bring up the item wheel, and hover over the desired weapon. You can now see a 'Condition' meter at the bottom of the entry for the weapon. 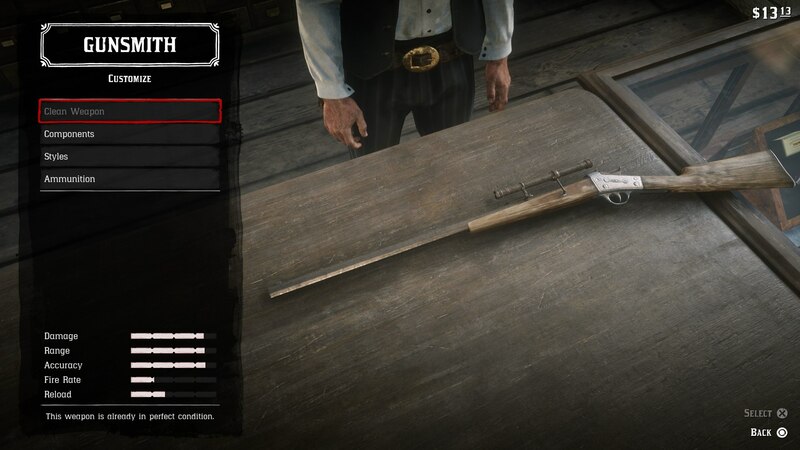 If your weapon is damaged at all, you'll see a button prompt on the lower right corner of the screen to 'Clean' the gun. Press the right analog stick if this is available, and you'll use a Gun Oil item to clean your weapon immediately back to perfect condition. Note that you obviously need to own a Gun Oil item to do this, and to purchase more, simply head to the nearest Gunsmith. Just below, we've got a list of every single Weapon in Red Dead Redemption 2, that's available for purchase from the Gunsmith. Note that the Carcano Rifle and Lichfield Repeater will be unlocked through story progress. 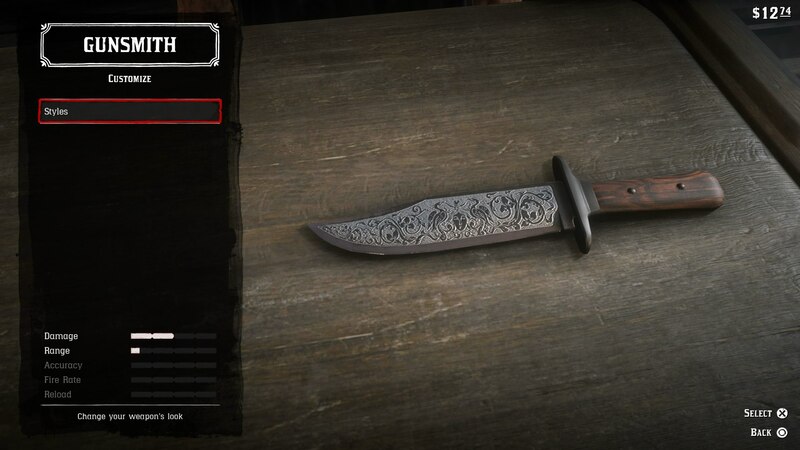 Your very own hunting knife. 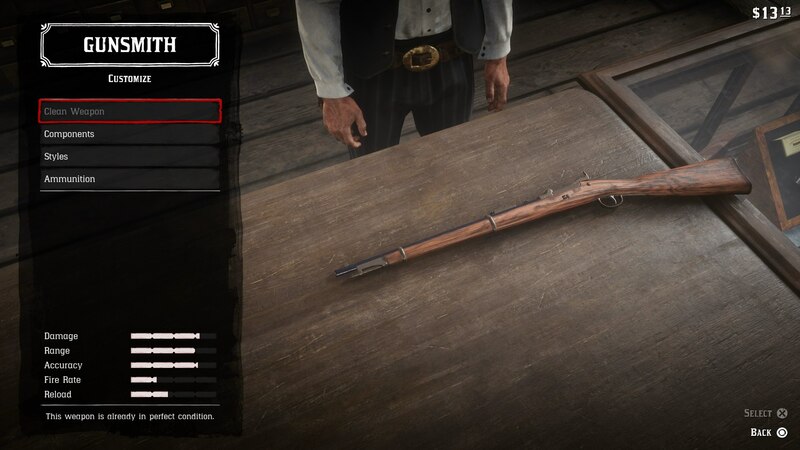 This is absolutely everything you need to know about customizing weapons in Red Dead Redemption 2, as with every new attachment or upgrade that you buy for a weapon, you can see the stat bonuses to damage, accuracy and more in the bottom left corner of the screen. 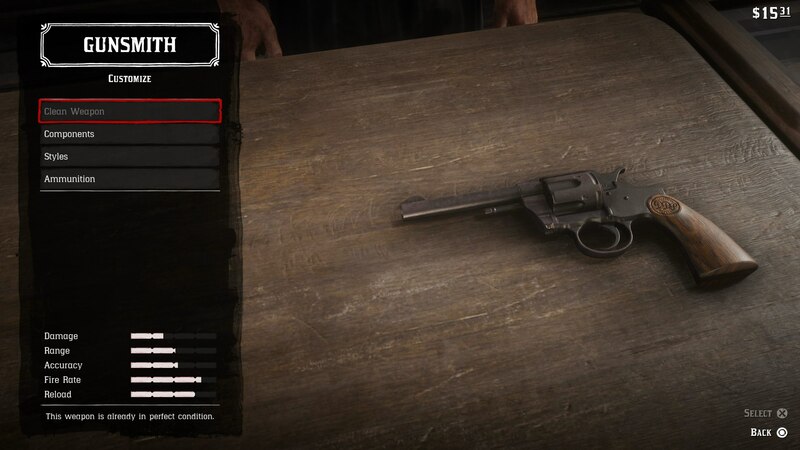 Now that we’re done here, why not continue ahead to our Red Dead Redemption 2 Deadeye guide, or our page on how to sell valuables in Red Dead Redemption 2, for some quick cash.